Well to quibble and parse words and whatnot: he can’t make key defensive plays at any point, I mean the ball has to be hit to him or an infielder has to throw a difficult ball to him – otherwise his job at first base is pretty pedestrian by defensive standards. Still, Jordan had a reputation as a great defensive player. In fact, his .988 career fielding percentage is tied for 28th best with people like Freddy Lynn, Mike Devareaux, Paul O’Neil, the great Paul Blair, Tim Raines, Andy Van Slyke, Jay Buhner, Steve Finley and others. There’s a fair number of Orioles on that list – Raines and Buhner are the only ones who never played for Baltimore. And guess where Jordan was born? You got it: Baltimore. Do the defensive metrics back up his fielding percentage and reputation? Sort of. His dWAR (defensive wins above replacement player) is 16.1, oddly enough most of his value came as a right fielder. What’s most misleading about this card is that Jordan played just 27 games at first in his career and played 1,382 games in the outfield. 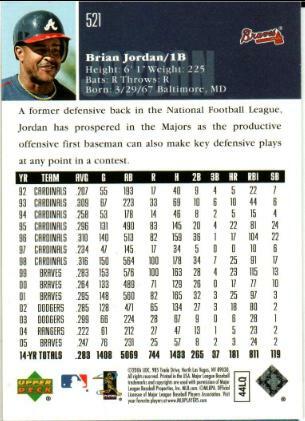 I always remembered Jordan as an outfielder but, based on this card, assumed he was an ill-suited first baseman – shows you can’t believe everything you read. Jordan was quite the underrated player. From 1995-2002, he accumulated 30.8 WAR (Fangraphs), the 35th most during that span and just a few ticks behind the immortal Frank Thomas. During that stretch, he hit .291/.341/.473 and averaged 18 HRs, yet made an All-star team just once. Jordan’s last season was the year this card was printed. He didn’t exactly go out on top. Still, I’ll always remember him as the foil to Deion Sanders. Sanders was the flashy one who was better at football than baseball. Jordan always seemed rather workmanlike and was clearly better at baseball than football. Either way, he fielded his position well, hit decently and was one of the better players for a seven-year stretch – not much more you can ask for from a career. Of course, I’d be remiss if I didn’t touch on the butchering of the English language. First, Jordan wasn’t really a first baseman. Second, “has prospered in the major leagues as the productive offensive…” just makes no sense. How about: “has prospered in the major leagues a productive offensive…” Third, the whole end of the sentence is Goobeldy Gook. This is up there with the all time greats when it comes to poorly written back of the base ball cards. It really should have been part of the 1987 Topps set. A stathead…er…An untrained observer with a working knowledge of the National League for the last eight years who stumbled upon the back of this card would likely assume that some combination of Roy Oswalt, Brandon Webb, Jake Peavy, Carlos Zambrano and Aaron Harang would fit the bill as the top starters in the National League from 2004-2009. Not so fast! 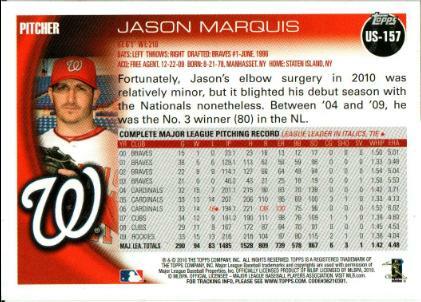 Marquis and his 9.5 WAR (Fangraphs) but amazing winability (80 Ws) is clearly involved, as noted by this fine 2010 Topps card. While that’s a lot of negativity, we can say that Marquis was durable (and averageish). 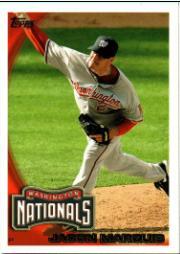 He threw 1,177.1 IPs during that stretch, the fourth most behind Oswalt, Harang and Zambrano. Of course, that took its tool as he started the 2010 season late and struggled to win just two games. Apparently, it’s hard to pitch to the score when the Nationals are involved. He pitched better on the surface in 2011, good enough to look like an innings eater to the Diamondbacks. Unfortunately, shortly after he was traded to Arizona, he broke his fibula and missed the rest of the year. Regardless, Marquis has come a long way from Staten Island and the Little League World Series. In case you don’t remember, Marquis was on the third-place little league squad in 1991. He even beat Chad Pennington. Pitching and winning must have seemed real easy in little league. It probably seemed harder but not impossible from 2004-2009. I imagine wining seems a lot more difficult now after struggling with losing teams and injuries. 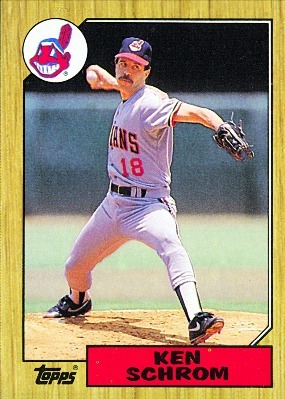 For some reason, the cards with the most interesting information seem to be from players who had limited to no appearances after 1987 (and obviously the 1987 Topps set was the gold standard for back-of-card information – or lack thereof). Schrom was no different. He wrapped up his seven-year career in 1986 by posting a 6.50 ERA, 5.70 FIP and 1.57 WHIP in 153.2 IPs. Until then, Schrom had been a reasonably, albeit completely average, innings eater over the course of his career. His best season (which wasn’t the year he made the All-star team, oddly (or not) enough) was 1983 for the Minnesota Twins. He went 15-8 in 196.1 IPs, and posted a 3.71 ERA, 4.23 FIP and 1.41 WHIP. His All-star appearance in 1986 was almost entirely driven by the BABIP gods. 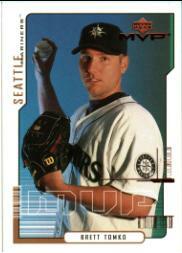 Before the ASG, his BABIP was .241 and he had a 3.88 ERA and 1.22 WHIP. After the ASG, his BABIP was .291 and he had a 5.44 ERA and 1.39 WHIP – holy regression monster. 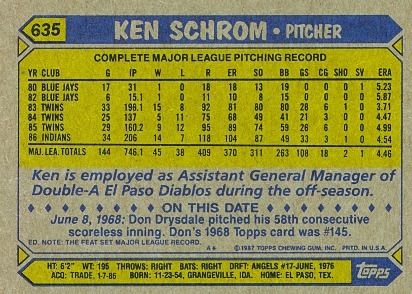 Schrom definitely learned the ins and out of baseball however. While playing, he spent over 15 seasons with the El Paso Diablos and now is an executive of the Corpus Christi Hooks. I always remark on the odd jobs players had to have in the off-season, even in the 80s. As odd jobs go, working with a minor league squad seems about the best. If you don’t know the Diablos, the organization graduated such notable players as Tom Brunansky, Bob Ferris, Teddy Higuera, Randy Johnson, Byung-Hyun Kim, Carney Lansford, Lyle Overbay, Brad Penny, Gary Sheffield, Dan Uggla, Brandon Webb, Cory Lidle, Carlos Quentin and Chris Snyder. It has to be pretty to cool to both be a major leaguer and help develop major league talent. Kudos to Schrom! Talk about a seemingly non-ominous ominous reverse jinx card. 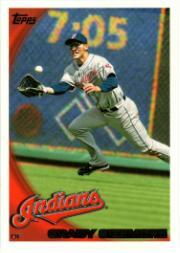 I’ve been a huge Sizemore fan since he went 20-20 in 2005 as a 22-year old. I’ve written about him for fantasy and I’ve handled this card carefully. It is one of those I wanted to write about but couldn’t get into it. Until recently, Sizemore went out there, played hard and fabulously and never missed a game. From 2005-2008, Sizemore played 639 games, or 160 per year, and put up a .281/.372/.496 line paired with superb defense in centerfield. But, maybe, just maybe, he should have taken a few more games off here and there. 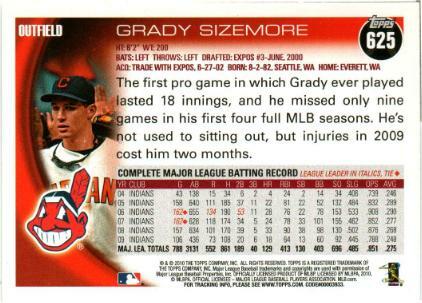 As the card alludes to, Sizemore missed two months in 2009. Unfortunately, that would be the beginning of a dramatic (hopefully abbreviated) Dale Murphy like swoon. Sizemore appeared in 210 games total from 2009-2011 and his production (.234/.314/.413) plummeted. At 22 and 23, Sizemore’s career trajectory looked a lot like Duke Snider’s did at similar ages. At 24 and 25, his career resembled the great Barry Bonds. Now, he looks a lot like Trot Nixon, Reggie Smith (albeit a very good player), Bobby Bonilla, Ron Gant and Ellis Burks. For awhile, Sizemore did it all. He is his high school’s all time leader in rushing yards and was a third round pick in the MLB draft. He was a shooting star and was part of the massive Bartolo Colon trade (Sizemore, Cliff Lee and Brandon Phillips), which basically ended the Expos. Heck, at the time, he even signed a pretty nice contract with an incredibly friendly 2012 club option – yet that option was declined (thankfully he got back together with Indians and hopefully his body will heal). If this is just Sizemore playing out the string with a body that quit on him, let’s remember his 2006 season. He became the second player in MLB history to have at least 50 doubles, 10 triples, 25 home runs, and 20 stolen bases in a single season. Here’s hoping he finds the magic elixir. I find his decline in K-rate somewhat startlingly, sure he went from a league that features the pitcher to one with a designated hitter, but he went from starting most of his games to relieving – perhaps that pitcher was a massive cushion for Tomko. Regardless, he totally needed that strength improvement program. 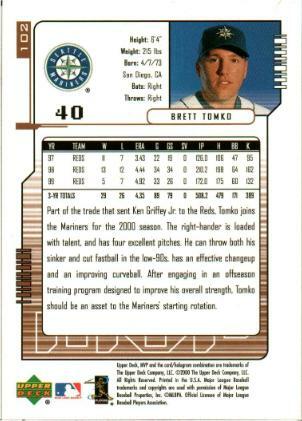 The card also notes that Tomko has four excellent pitches. While we don’t have pitch value data going back to the beginning of his career, I find it hard to believe he had one excellent pitch. From 2002-2011, his wFB totaled -20.1 and his wSL was -16.1. About the only thing the card got right is that his curveball was improving: his wCB was 3.7 in 2002 and 0.8 from 2002-2011. Lastly, at the time of the Griffey trade, there was no way people saw Tomko as loaded with talent. If the Mariners thought he was loaded with talent, he would have started more than 12 games over two years and wouldn’t have been traded just two years and 127 innings later. In fact, he was traded three times from 2000-2002 and, once he made it to free agency, travelled up and down the west coast signing with the Giants, Dodgers, Padres, and Athletics. 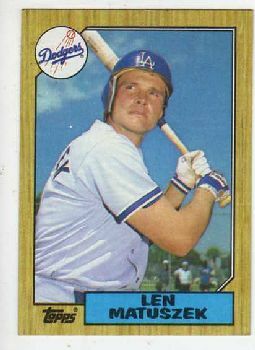 He, perhaps, pitched poorest for the Dodgers, earning the nickname: “Bombko,” which, in any other sport, might be a positive thing. Tomko’s 1.25 HR/9 from 1997-2011 is the 31st worst during that span (and look at the ballparks he pitched in). While his career fell short of its promise, his personal life is rosy: Tomko is married to Julia Schultz (her google image search is NSFW but worth it) and has become an artist – I wonder what he wants to paint (certainly wasn’t corners like Bob Tewksbury, hardy har har). I really don’t want to drag McDonald through the mud…but the person who wrote the back of this card must have about the loosest grasp of the game of baseball as anyone. Since when does a pivotal base runner steal just six bases? If your previous career high was 3 stolen bases two years ago, saying he established a career high is meaningless. Rickey Henderson or Tim Raines establishing a career high, now that’s back of card worthy. Similarly, two years before this card was printed McDonald accumulated 14 RBIs. It’s just not interesting (or maybe in that fact that it is so uninteresting it has become interesting) that he beat that total by two. 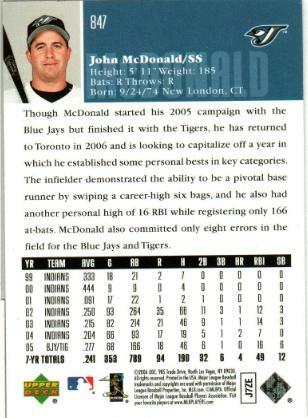 The author did get something right – it looks like McDonald was good defensively in 2005. He had the third best UZR of his career, so there’s that. In actuality, 2005 was McDonald’s best season, but not because he stole six bases or knocked in 16 guys. No sir. It was the only time his average on balls in play was above .290 (his career number is .267). It’s really amazing that he has stuck around for 13 seasons. I can’t imagine the author of the back of this card lasted that long. Still, his career isn’t without note. In 2007, he was voted the most popular Blue Jay (beating Roy Halladay). He is often known as the “Prime Minister of Defense” which, apparently, is a play on the first prime minister of Canada (yeah I thought they just let those Mounties run the country also). But, most notably, McDonald is one of two players in major league history, according to Wikipedia, to be traded for himself. Of course the most momentous trade of McDonald’s career would come in 2011, when the Blue Jays shipped him and Aaron Hill to Arizona for Kelly Johnson. The desert wasn’t kind to McDonald who batted just .169/.222/.203 for his new team, but he’s been average on defense! As a glove man, he’s fantastic. As a baseball player, he’s better than Willie Bloomquist. As you read this on a Kindle or iPad, remember that, not too long ago, it was odd that someone was into “audio and video recording.” Hell, I made three videos of my puppy last night. Fellow 1987 Flip Sider (and one-time Phillie), Dan Schatzeder also had a thing for video recorders. Things sure have come a long way since 1987 – it does seem like the “nerds” have taken over. I’m not just talking about stat geeks, but if you watch commercials for the latest video games, some of the biggest stars (Kobe, Jonah Hill, etc.) are itching to be in them. It is, quite frankly, cool to play video games. Of course, I play MVP Baseball 2005, NCAA Football 2010 and GTA Vice City, so I might be behind the times. 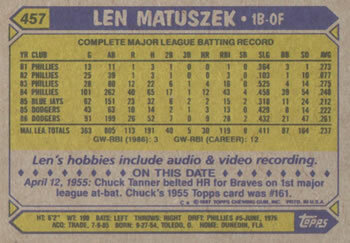 Matuszek is a Pong-esque relic from a different era, a no-hit corner guy. He was drafted by Philadelphia in the 5th round in 1976. He toiled in the minors from 1976-1980, touching double digit homers once, but showing a decent ability to get on base (he never posted an OBP below .345). He made his debut in 1981, but saw just 14 plate appearances. He got triple the plate appearances the following year, but hit horribly (.077/.119/.103). He got significantly more run in 1983 (87 plate appearances) and looked good (.275/.306/.525), at least by 1983 Yuengling-goggles standards. Following that small sample size opposition pitching drubbing, the Phillies installed Matuszek as their starting first baseman in 1984. He just happened to be replacing Pete Rose. He didn’t do so hot, though, hitting just .248/.350/.458. That OBP could play but the lack of power couldn’t. He was shipped to the Blue Jays in April of 1985 and then from Toronto to the Los Angeles Dodgers in July for a broken down Al Oliver. He didn’t do anything for the Dodgers, aside from appearing in three games in the NLCS and going 1/1 with a run. Two years later, he went .067/.125/.067 after 16 plate appearances, and his major league career would be over. Hey more time for the AV club.